This recipe is 5 Freestyle points per serving, 1 chicken breast sliced and 1/2 cup cooked rice. Place the chicken breasts in a gallon-sized ziplock bag. Add all of the ingredients to the ziplock bag except the rice pouches. Close and mix to fully combine. Place in the refrigerator and let marinate up to 1 day, or as little as 30 minutes. Once the oven is preheated, add the chicken breasts to a shallow baking pan (like a Pyrex dish). Pour the remaining marinade over the chicken (see note for an alternate method). Bake for about 20-25 minutes, or until the chicken is cooked through. Remove the cooked chicken from the oven. Place on a cutting board and slice into thin slices. Microwave the 2 pouches of rice and serve immediately. 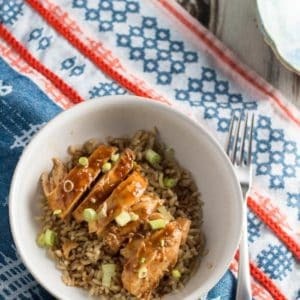 You can use the leftover marinade to pour over the chicken and rice. To do this, after you place the chicken breasts in the oven to cook, place the marinade in a small pot. Turn the pot on to medium-low heat. Allow the marinade to boil and then stirring constantly, allow it to thicken up. Once the chicken is finished cooking, the marinade should be ready to be poured over the chicken. Doing this will affect the Freestyle points value, but if your kids want more sauce, you can definitely provide that with the leftover marinade.